SYNOPSIS OF THE ISSUE - See here for a discussion of the issue with the Plano Tomorrow Plan and the history. 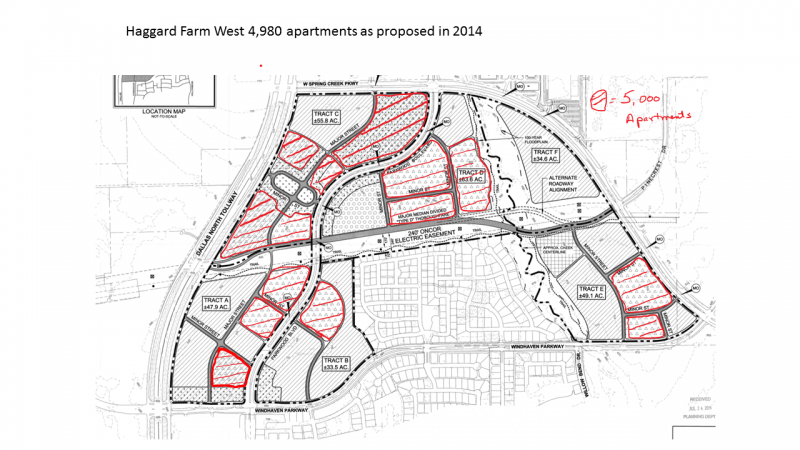 See this discussion of how 40,000 of more apartments could get built under the Plan. Example 3 Preston & George Bush. 460 units already at the Broadstone. How many coing when the Toyota Dealership moves out later this year. 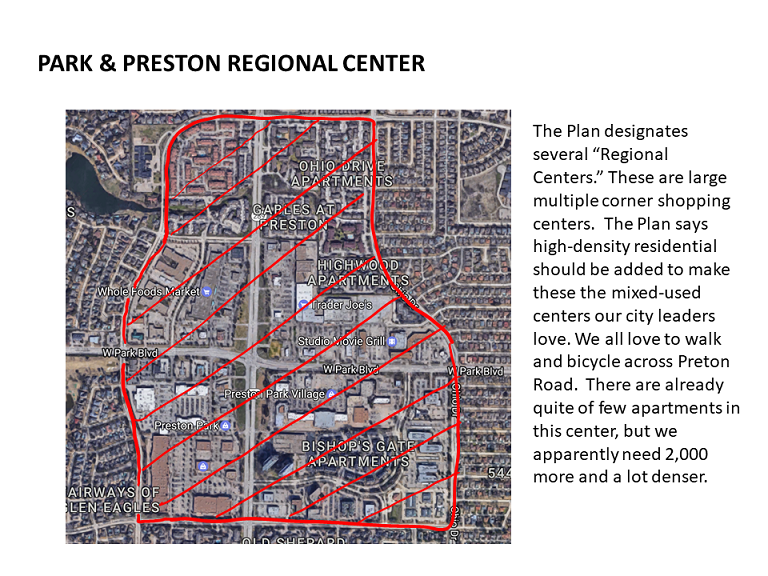 THE ISSUE - If you are unfamiliar with the issues surrounding Plano's Comprehensive Plan, see a summary of the issue below or see the attached letter sent in early 2015. Here is the Land Use Plan as adopted. As discussed below, it encourages and will allow the addition of high density residential almost anywhere that there is not currently a house. 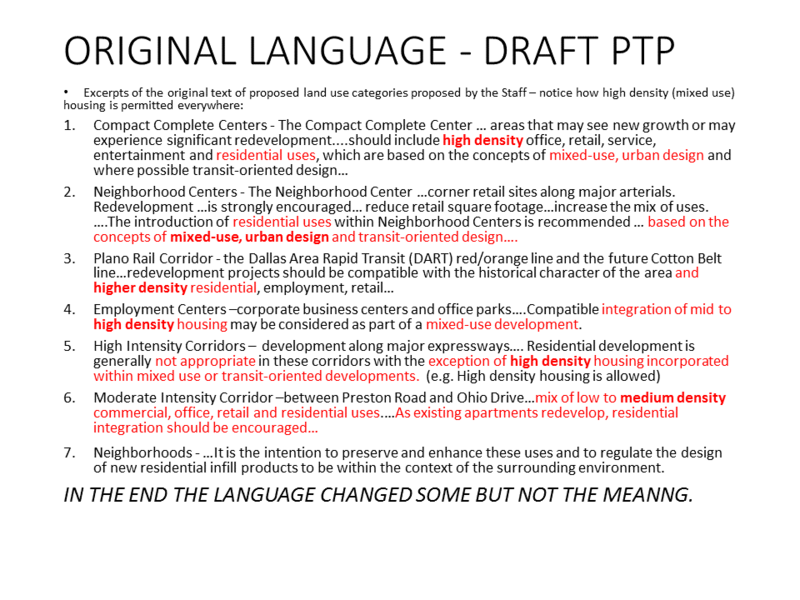 Although the Plan uses words like "generally not appropriate" in certain designations, it is clear that these weasel words will actually be used to allow high density residential throughout the city. This becomes apparent, when you compare to the original draft language proposed by the staff and then realize the Staff was only changing the words to make it less apparent what they wanted; they were not changing the meaning. What was particularly troubling was that the city did a survey in 2013 / early 2014 of its residents about that asked questions about how the remaining available land should be used. 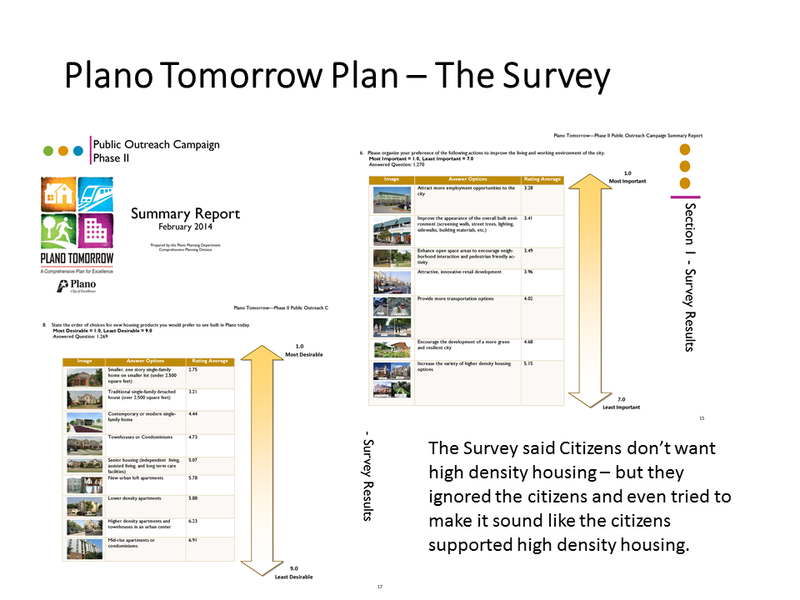 Even though the survey had questions that were slanted to get an intended result, it was very apparent from the survey that the citizens did not want high density development. 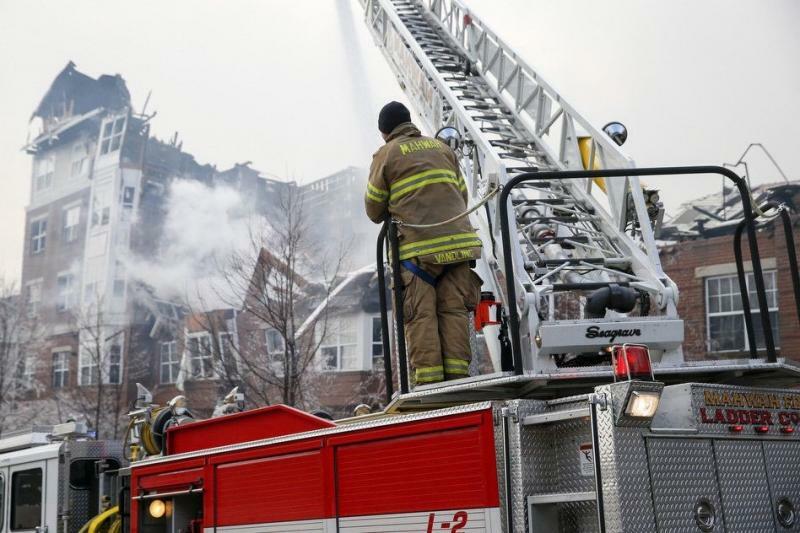 When the City presented its Plan in the fall of 2014, it claimed the survey supported the Plan. This was a complete distortion of the survey. See a couple of key survey responses here. These matters are discussed further below. The Citizens see this Plan as an intent to Urbanize Plano and a threat to Plano's suburban environment that has made it a safe city with great schools and a high quality of life with a very diverse popluation. This is the reason most of us selected Plano as a place to live. The high-density urbanization is overcrowding our streets, schools, parks and infrastructure. Plano for 20 years stated that it had a design capacity of 270,000 people. We are now at 285,000 and have already approved enough additional projects to take the city to 300,000. We do not need to destroy what is good by continuing down this urbanization path. We do not want to be "just like Dallas." here is an example letter in Word and PDF. I ask you to vote No on the Plano Tomorrow Plan until it is substantially amended. I am deeply concerned that my opinion and my neighbors’ opinions regarding the future development of Plano is being ignored. 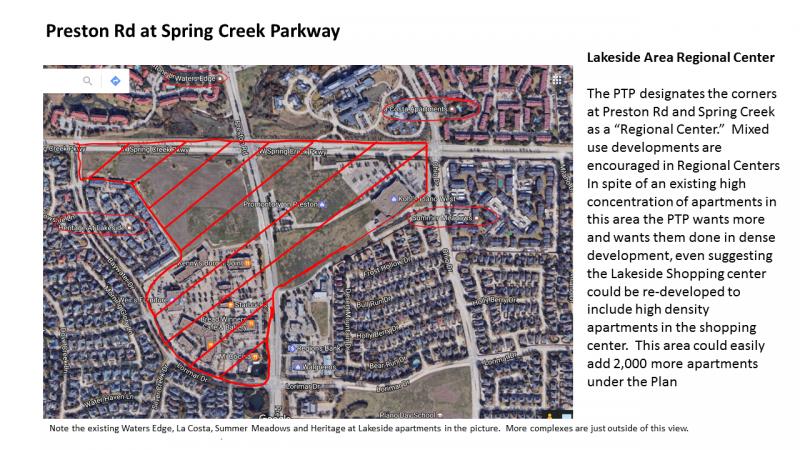 I object to the tens of thousands of dense apartments the Plan seeks to add to the city including in the following areas: Shops of Willow Bend/Costco, Park & Preston Shopping Center, Lakeside/Kohls Shopping Center, Windhaven Parkway, transit corridors and at other four corner retail sites throughout the City. Traffic conditions at many intersections or the city are horrible and our schools are showing signs of stress. We don’t need additional high density apartments to make it any worse. Despite feedback from library open houses, surveys, speeches, letters, and community meetings, the direction of Plano Tomorrow Plan has not really changed. I pay Plano property taxes and my voice should be heard. 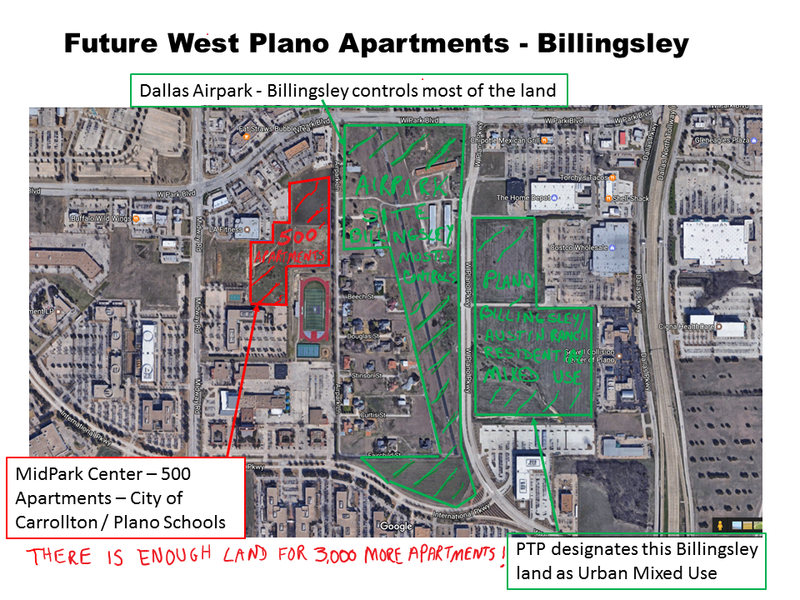 It’s time that Plano officials do what the taxpayers want and not what the developers and political insiders’ desire. I support the amendments that Plano Future has proposed to you on the Plano Tomorrow Plan and zoning interim amendments. Please do the right thing and represent the voice of the citizens of Plano, which is what you were elected to do. Please copy committee@planofuture.org so we know it has been sent. 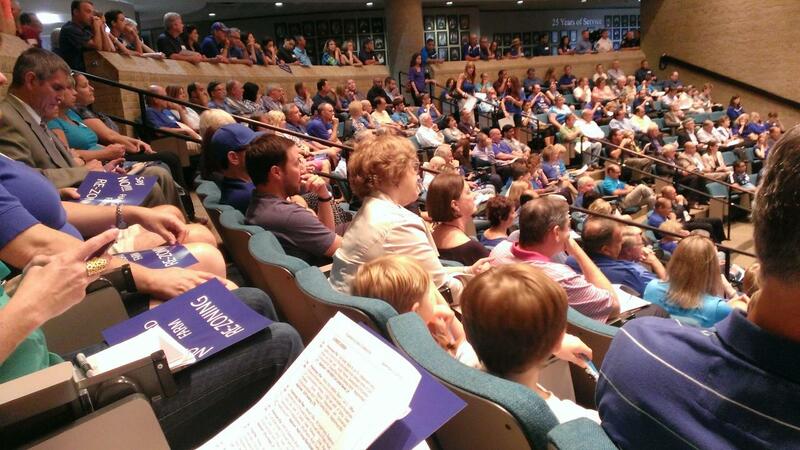 Already over 350 residents of Plano have sent in a letter. 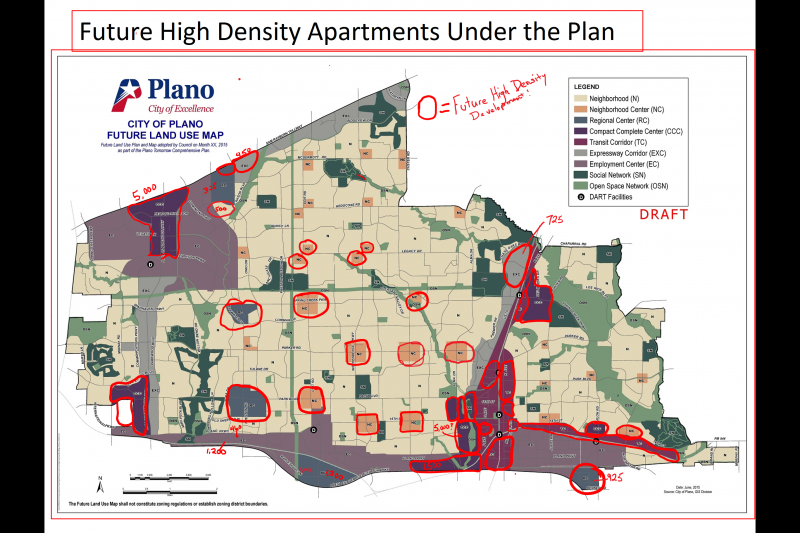 I do not support the Plano Tomorrow Plan, because I have learned that intent is to increase the population of Plano by 25% or more and potentially double the number of apartments in Plano. What I find particularly troublesome is that the communications about the Plan never state that this could be the consequence of the Plan’s adoption. In fact, I learned that the P&Z and the city intentionally omitted such statements and its backers cautioned others not to make statements about these potential increases in population and apartments. 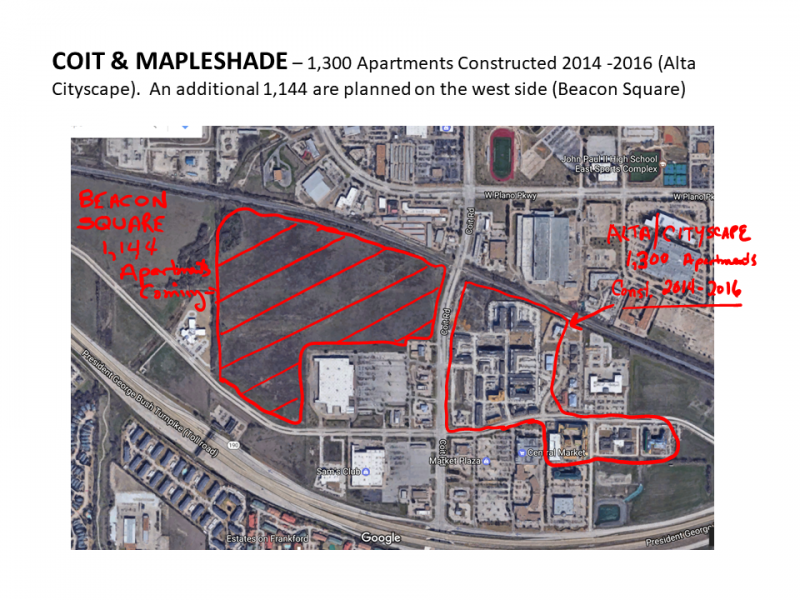 It appears that the backers of the Plan realize that if that word got out, the Plan would face great opposition from the citizens of Plano. I believe in government that is transparent and open. That does not appear to be happening here and that concerns me greatly. 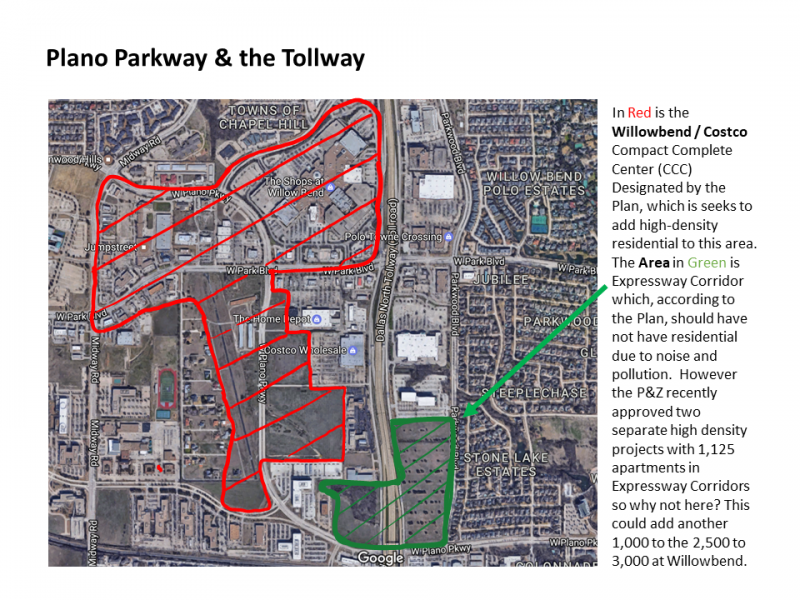 Policy - Plano will reserve its remaining undeveloped land for high quality development with distinctive character, emphasizing businesses offering highly skilled employment and limiting housing and retail uses except when integrated into compact complete centers to ensure adequate land for projected employment growth. Policy: Plano will conserve and enhance established residential neighborhoods through city programs, initiatives, and regulations that support neighborhood identity; ensure safe, walkable communities; and preserve the suburban form that contributes to the overall character and livability of the neighborhoods. However, actions speak louder than words. 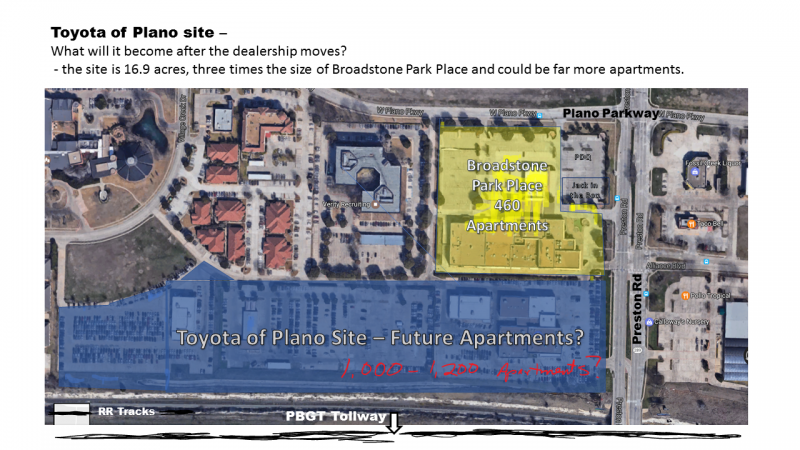 P&Z approvals through January 2015 will increase the number of apartments in Plano by 30% from the level at January 1, 2014. Several of these developments have taken place on undeveloped land that could have been reserved for future employment opportunities, do not appear to be “high quality development” and it is apparent this is just the beginning of the trend. Most of the available land ends up being in areas identified by the plan as “Compact Center,” “Expressway Corridor” or “Rail Corridor” and in each of these areas , exceptions are made to allow apartment developments. Building apartments is not economic development and does not create meaningful jobs for the City. 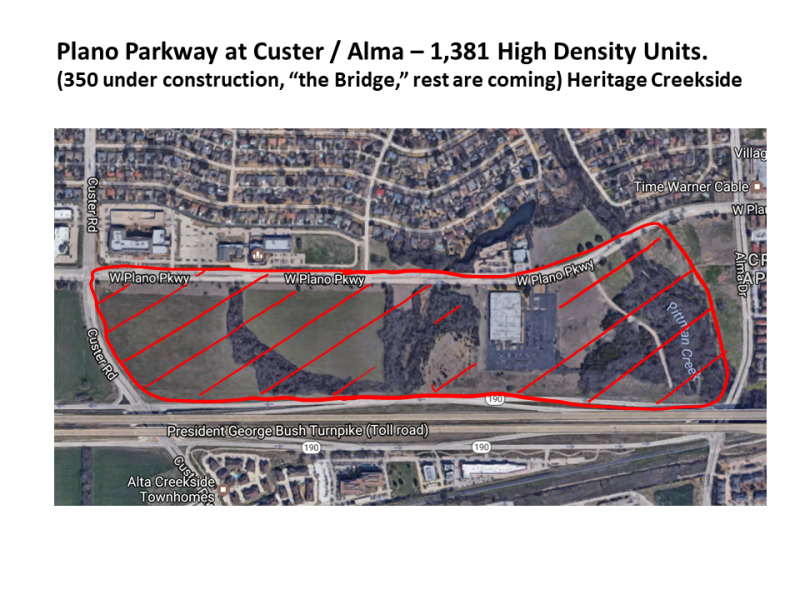 Increasing the population by 25% and doubling the number of apartments in Plano does not conserve our neighborhoods and does not preserve our suburban form. For these reasons I believe that the Plan needs to change. Before the Plan is considered for adoption, the Plan should discuss the specific levels of population growth and apartment development that could occur under the plan as well as any mechanisms to assure that new developments are in fact “high quality” and that most available land in the city is preserved for true economic development, such as corporate and general offices and medical uses or for recreational, retail and entertainment purposes. The number of new apartments, their location and the overall population growth should be very modest so as to continue our suburban form. Please send you comments to the Planning and Zoning Commission on the Plano Tomorrow Plan now. Ideally write you own letter. If that is too much effort, we have multiple example letters. 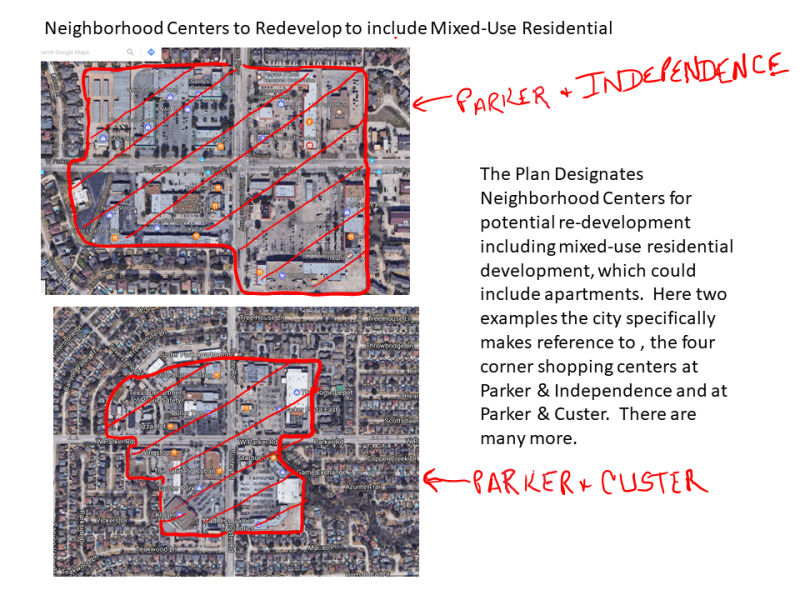 If you would like a more extended analysis and discussion of the issues with the Plano Tomorrow Plan, see ﻿this link﻿.